Fifty years later, his friend and fellow musician, Sid, must relive that unforgettable time, revealing the friendships, love affairs and treacheries that sealed Hiero's fate. From the smoky bars of pre-war Berlin to the salons of Paris -- where the legendary Louis Armstrong makes an appearance -- Sid, with his distinctive and rhythmic German-American slang, leads the reader through a fascinating world alive with passion, music and the spirit of the resistance. 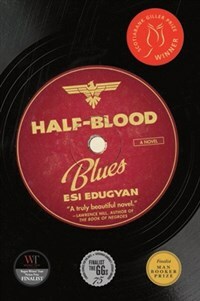 Half-Blood Blues, the second novel by an exceptionally talented young writer, is an entrancing, electric story about jazz, race, love and loyalty, and the sacrifices we ask of ourselves, and demand of others, in the name of art. Esi Edugyan has degrees from the University of Victoria and Johns Hopkins University. Her work has appeared in several anthologies, including Best New American Voices 2003. Her debut novel, The Second Life of Samuel Tyne, was published internationally to critical acclaim. She lives in Victoria, British Columbia. Please visit www.esiedugyan.com for more information.